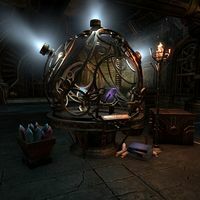 Transmutation Stations are a type of crafting station that was introduced in Update 16 as part of the Clockwork City DLC. This crafting station has the ability to change an item's trait, for a cost of fifty Transmutation Crystals. Only one Transmutation Station can be found in the world, at the Hall of Refined Techniques in the Clockwork City's Brass Fortress. However, stations can also be purchased as furnishing items from the Master Writ merchant for 2501,250  or from the Crown Store and placed in player houses. As such, players without access to the Clockwork City DLC can still change traits via player housing. In order to craft in the new trait, this trait must be researched in the appropriate skill line. Crafting requires Transmutation Crystals, which can be acquired from Veteran Trials or dungeons. Transmuted items are bound, and cannot be sold or traded to other players. They also cannot be researched by other characters on your account. This page was last modified on 10 May 2018, at 05:24.